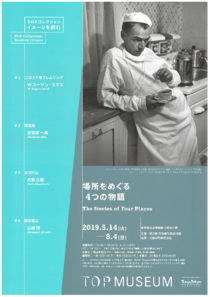 The TOP Collection is an exhibition that presents works from the Tokyo Photographic Art Museum Collection. This year's theme is "reading images." We will be thinking about the visual images in the works and how they might be interpreted. Using individual photographs and series made up of multiple pictures, which were specially selected from the museum’s collection of over 35,000 items, we will focus on the story told by each of the works. As we shed light on the underlying meaning and relationship between the works, and turn our attention to the universal narrative that is contained in the photographic medium itself, we invite visitors to engage in the rich viewing experience of reading images. The first part of the exhibition, starting in the spring, deals with the stories of four places. The artists looked carefully at a place or region, and in addition to capturing the specific way of life, landscape, and events that occurred there, they apprehended the essence of hidden things and universal meanings that dwelled beyond real phenomena, and composed their works out of photographs and texts. In this exhibition, we examine four approaches that are closely connected to these places and focus on the expansive narrative world that arises from each of them. This work, which originally appeared in the September 20, 1948 issue of the weekly pictorial magazine Life, is a masterpiece of the socially aware photo essay. It was shot and edited with a humanistic perspective by W. Eugene Smith, one of the most preeminent documentary photographers. The work focuses on the busy life and work of Ernest Ceriani, the only doctor in the country town of Kremmling, Colorado, home to approximately 2,000 people. Hashima (commonly known as Gunkanjima or "Battleship Island"), an island in Nagasaki Prefecture, was the site of a flourishing undersea coal mining business from the 19th century until well into the 20th century. The mines were closed and the island was abandoned in 1974 after Japan's primary source of energy switched from coal to oil. In 2015, Hashima was designated as a UNESCO World Heritage Site. This series of photographs by Narahara Ikko, who at the time was an up-and-coming artist, serves as a valuable record of the island when it was still full of activity. The photographs powerfully reflect Nakahara’s image of a place where people survived in limited conditions isolated from the outside world. To shoot this series, Naito Masatoshi became an ascetic practitioner and immersed himself in the religious realm and rituals of Dewa, a sacred site of Shugendo (mountain asceticism). Alongside the works, we present the artist's ethnological theories and anecdotes related to making the series, which came to light in the Naito Masatoshi: Another World Unveiled exhibition, held at the museum in 2018. The series was honored with the Domon Ken Award in 1983. Heliography, a series of time-lapse photographs based on the concept of pictures made by the sun, is one of Yamazaki Hiroshi's most important works. Ten Points Heliography was conceived as the final form of the series, but today it has largely been forgotten. In this exhibition, we explore the magnificent concept and production process that Yamazaki used to simultaneously shoot the work at ten places in Chofu, Tokyo over a two-day period 36 years ago. Sponsored by Toppan Printing Inc.
You can use the "Grutto Pass 2019" for this exhibition. The curator in charge of the exhibition will give an explanation of the exhibits from 16:00 on the dates. Participants should gather at the entrance to the 3rd floor gallery with an entrance ticket stamped for that day. The curator in charge of the exhibition will give an explanation of the exhibits from 18:00 on the dates. Participants should gather at the entrance to the 3rd floor gallery with an entrance ticket stamped for that day.